Cosmetologist since 1994, Doctor Alessandrini is the founder of Floèm. 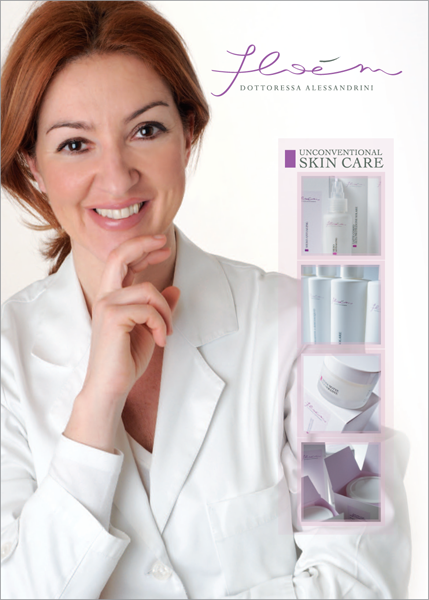 The intent of formulating and providing the cosmetics market with a range of non-conventional creams CAPABLE OF PRODUCING REAL BENEFITS FOR THE SKIN due to its high quality and substantial amounts of active ingredients, in addition to the added value supplied by the formulations, derives from the personal need to deal with the deep marks that teenage acne left on her face. Unsatisfied by what aesthetic medicine and cosmetological remedies offered at the time, after 15 years and over 5000 experiments, she along with a professor within the Masters Degree program of Science and Cosmetic Technology at the University of Ferrara gave life to a range of highly effective formulations. Technological innovation and the advent of plant stem cells will further contribute to the increase in intrinsic value and effectiveness of the Floèm product line.